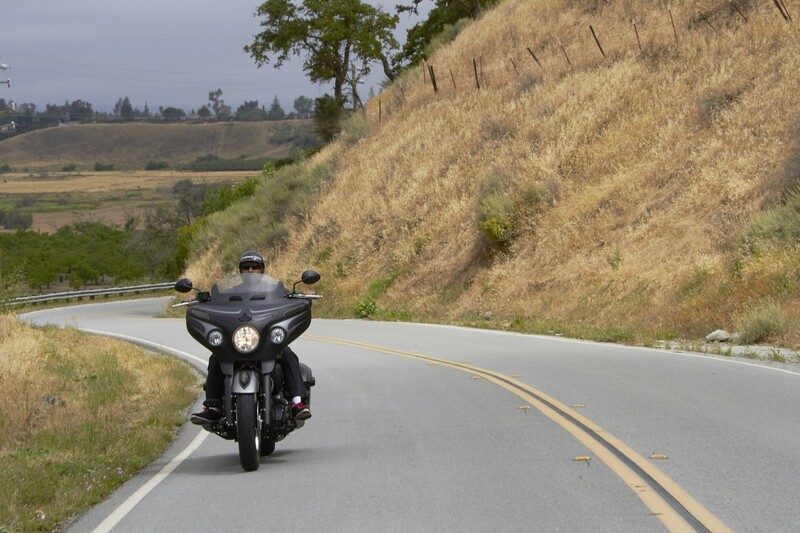 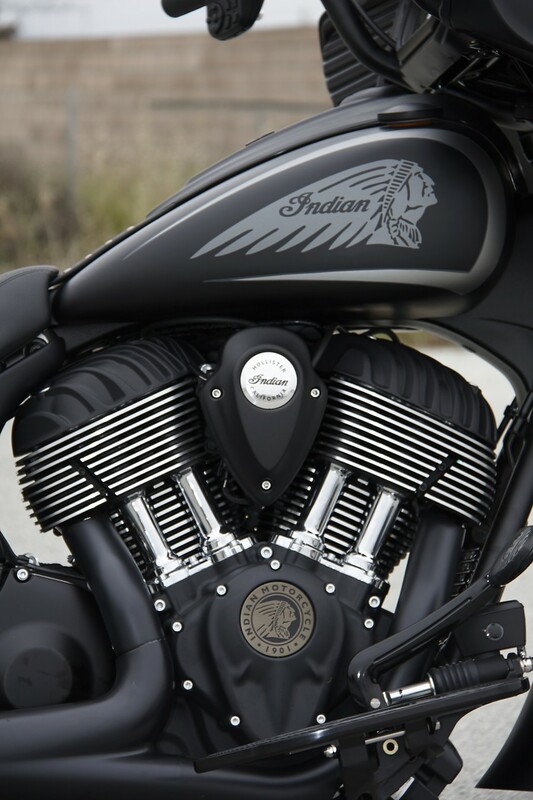 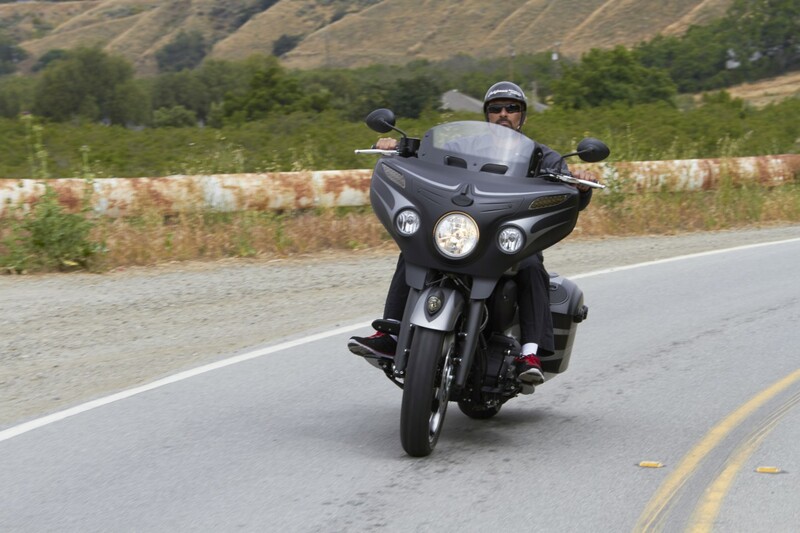 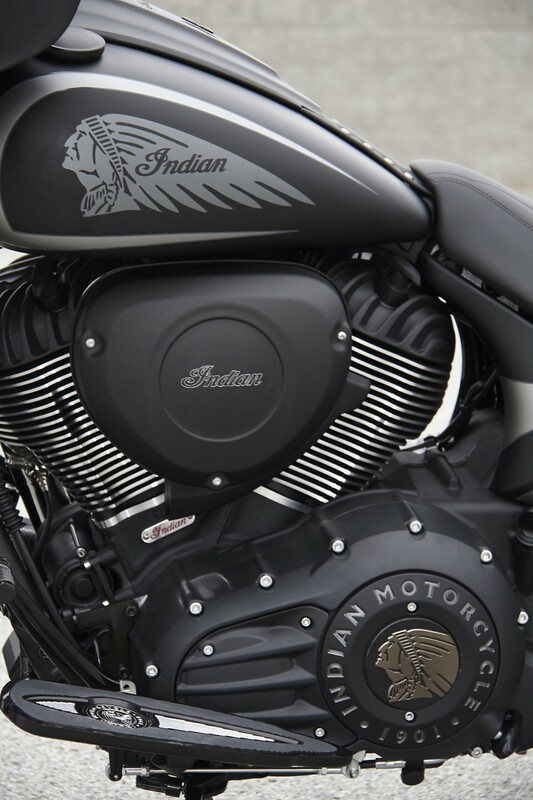 Indian Motorcycle, America’s first motorcycle company, is proud to present the “The Redeemer” built by Hollister Powersports of Hollister, Calif., utilising the new Indian Chieftain Dark Horse® motorcycle, a bike that is an ideal base for a custom. 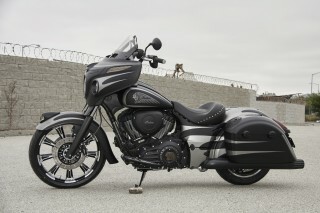 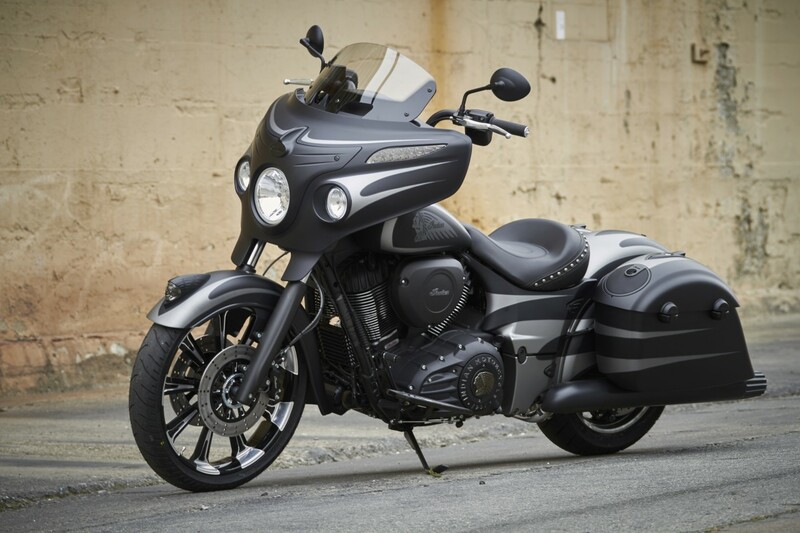 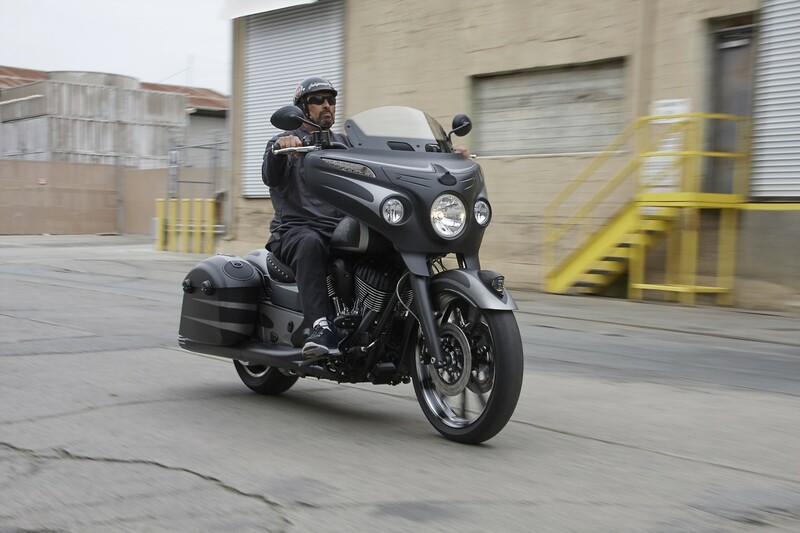 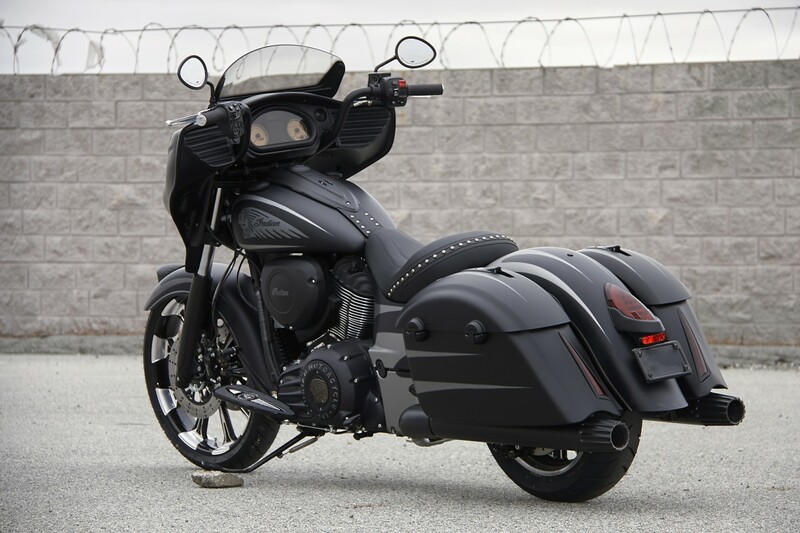 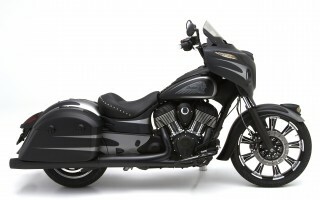 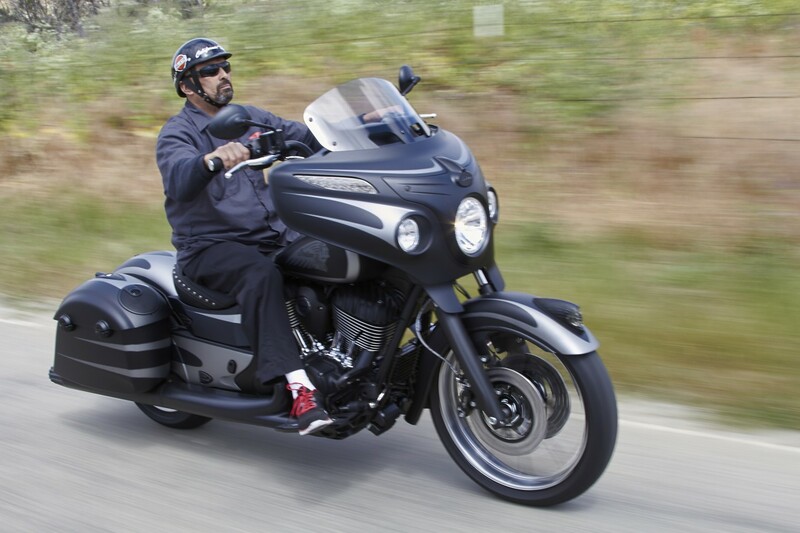 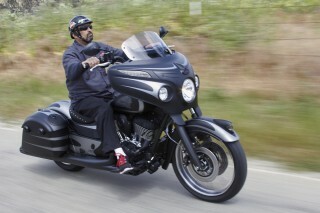 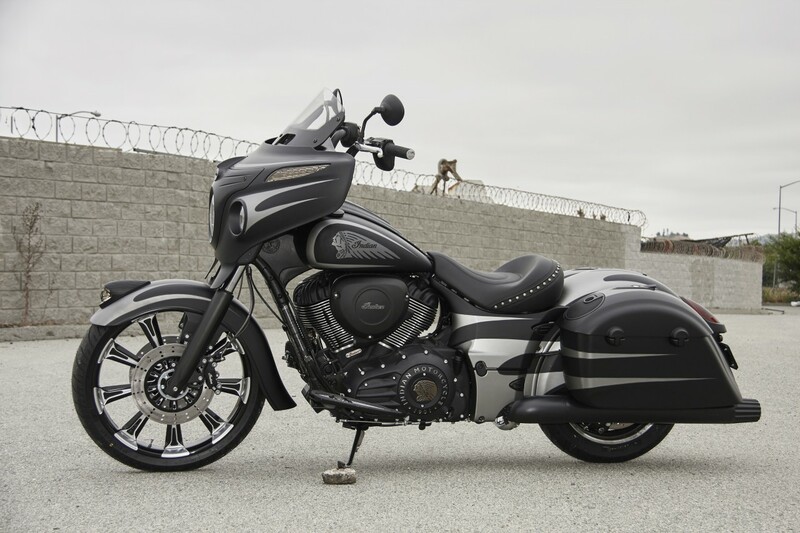 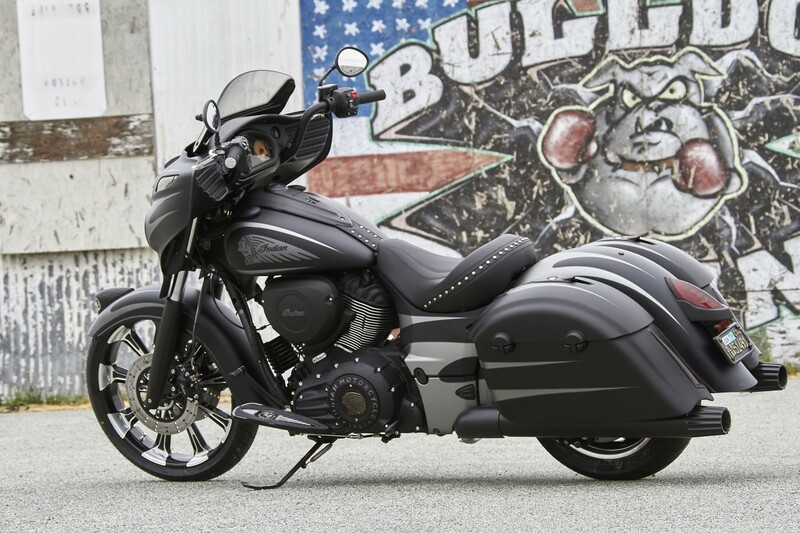 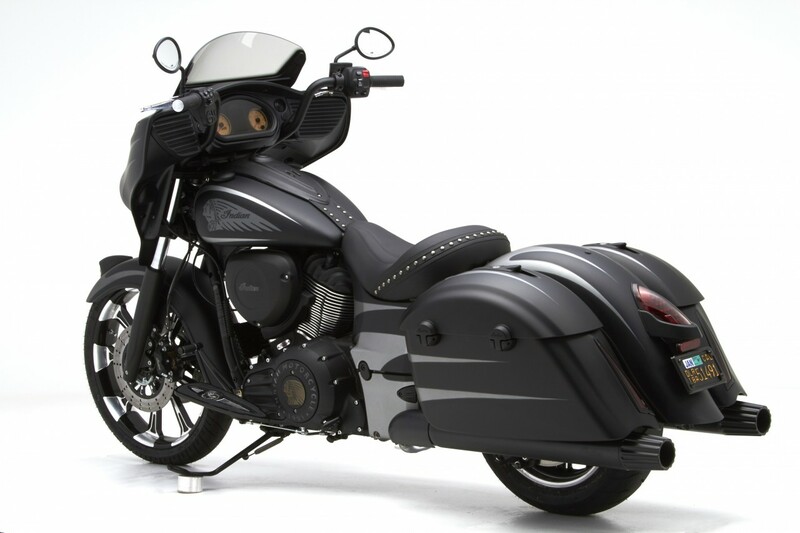 A bagger with an undeniable presence, the 2016 Indian Chieftain Dark Horse offers a ton of matte black, a flicker of chrome, and a wealth of standard features to roll as one of the most badass American-made V-twin bikes on the market. 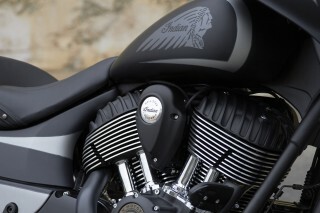 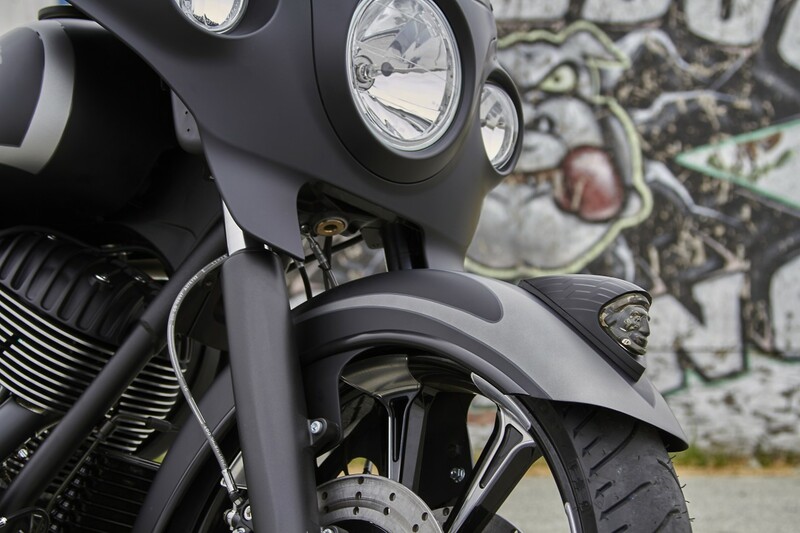 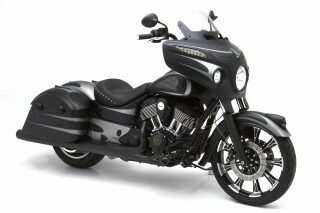 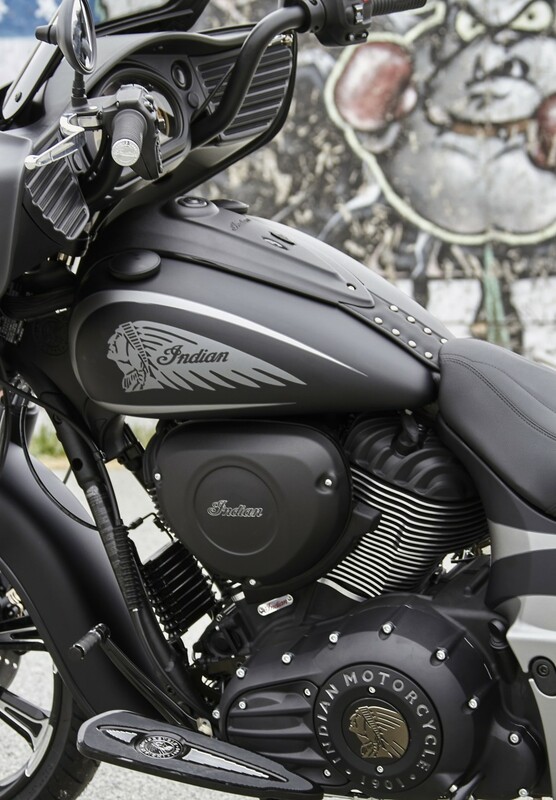 Hollister’s approach to customising took the Chieftain Dark Horse and added modifications that would be easily approachable for any owner who wants to recreate the look with their own vision. 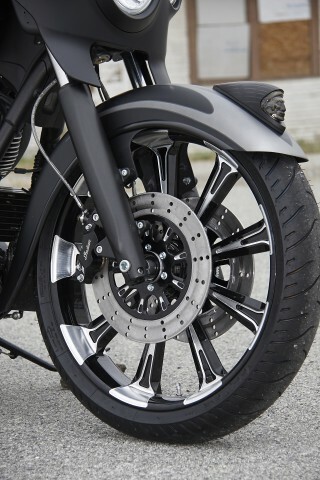 Hollister trimmed the stock fender to reveal more of the custom wheel and lighten the overall look of the bike. 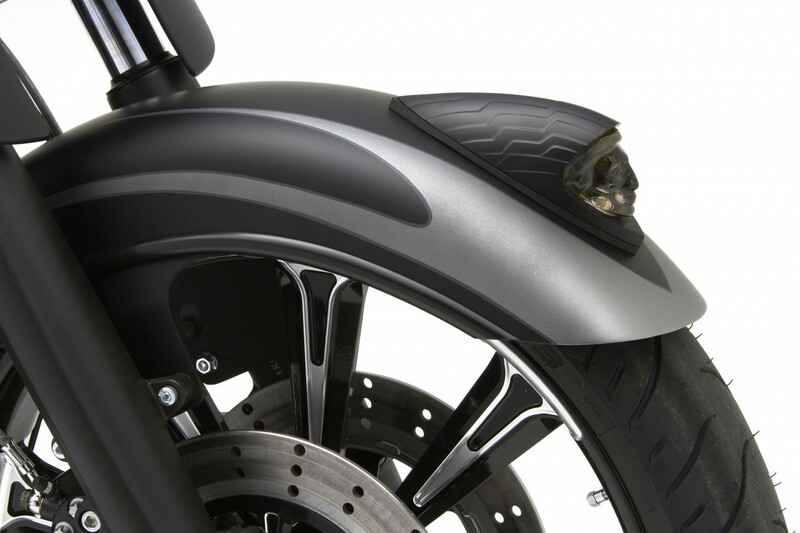 The fender skirts were cut back and the caliper covers were removed, dramatically changing the front profile of the motorcycle. 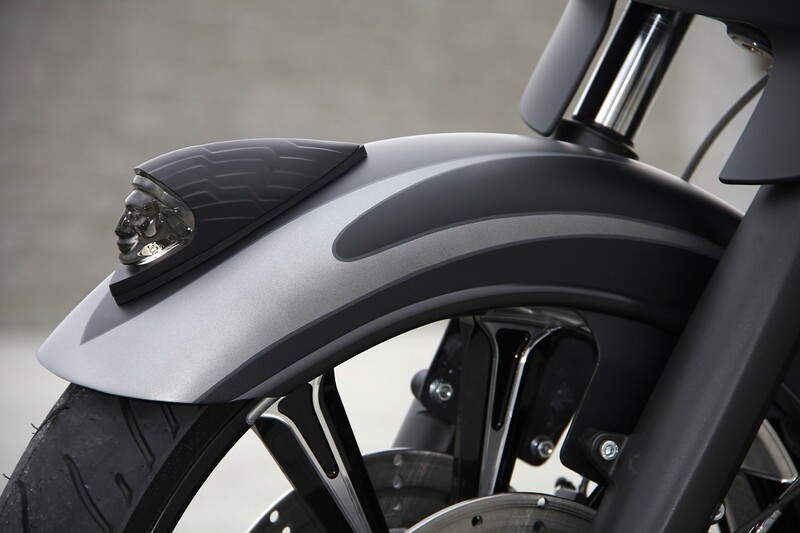 The fairing is stock, but painted with speed scallops that tie in with the front fender, tank, side panels and saddlebags. The scallops are painted on the rear fender as well, so even if the saddlebags are pulled off the speed scallops theme still plays throughout the bike. 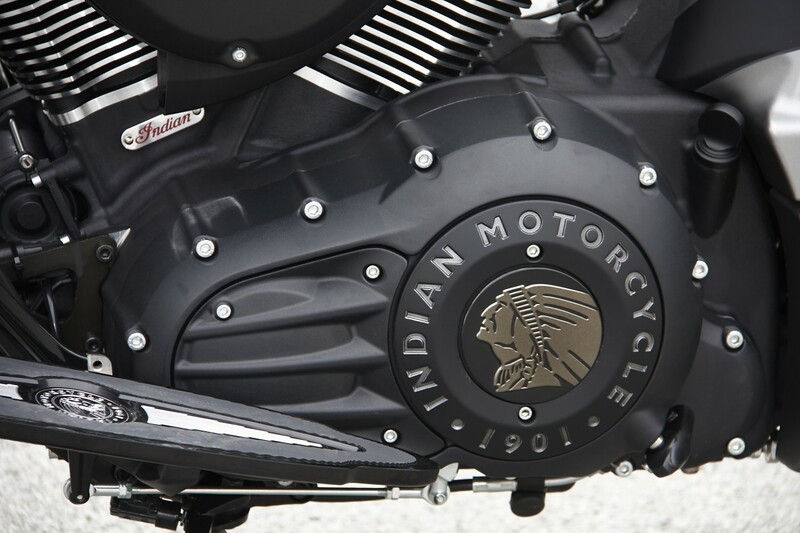 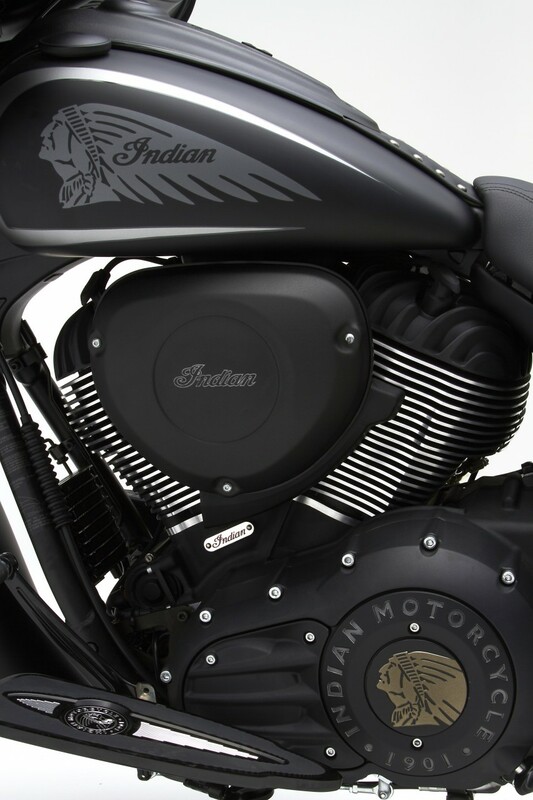 The engine jugs remain as they did when they left the factory, but Hollister put a little matte paint on the otherwise gloss side covers and added highlighting to the ‘Indian’ script on the air-cleaner in matte silver to stand out. 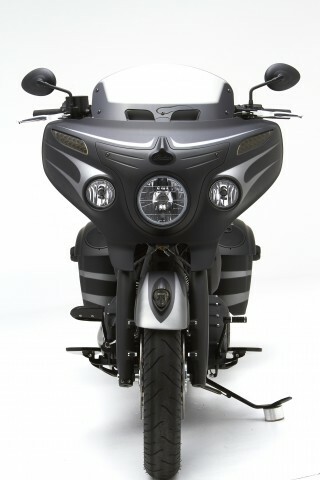 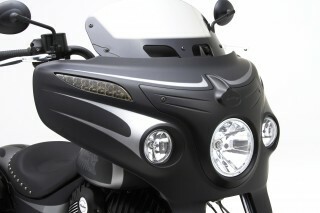 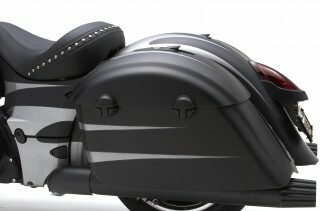 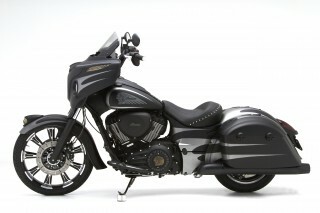 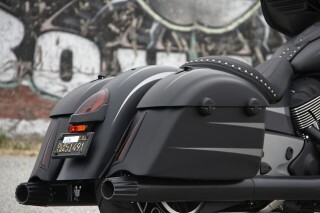 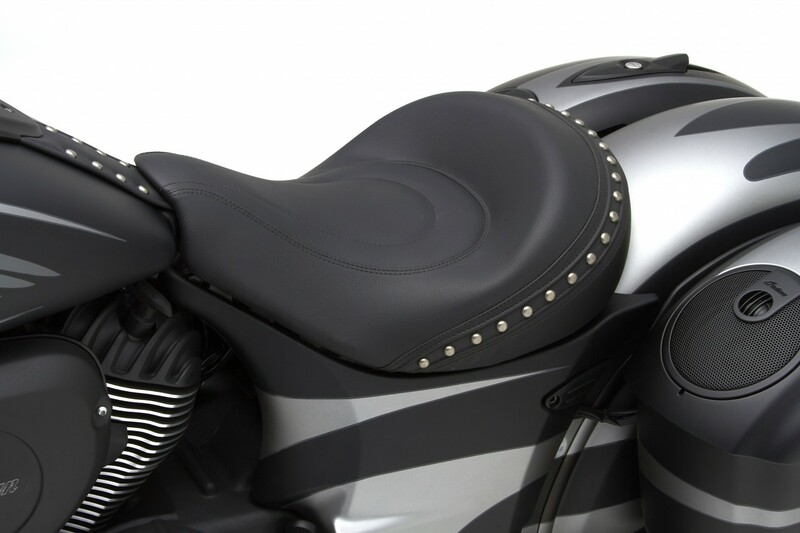 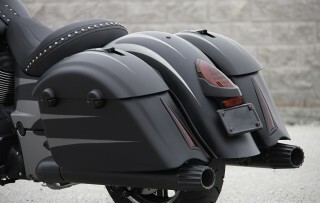 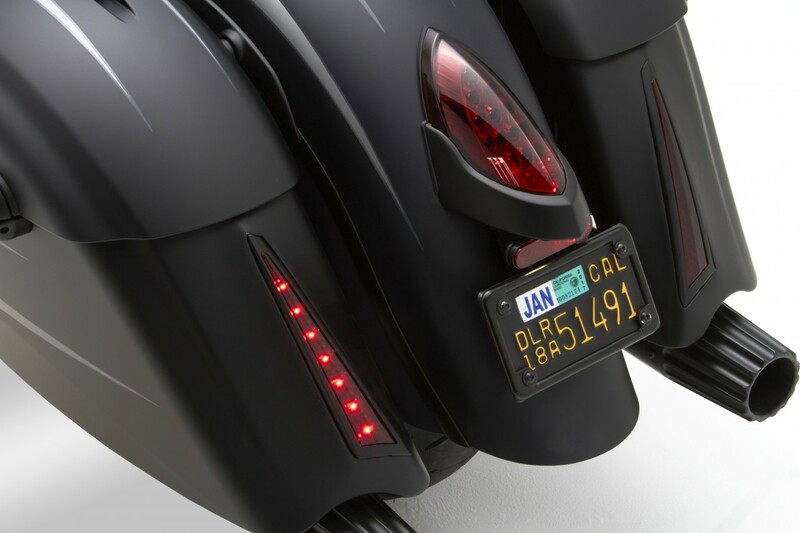 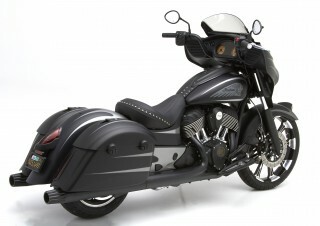 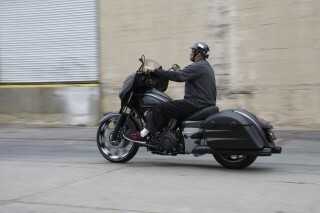 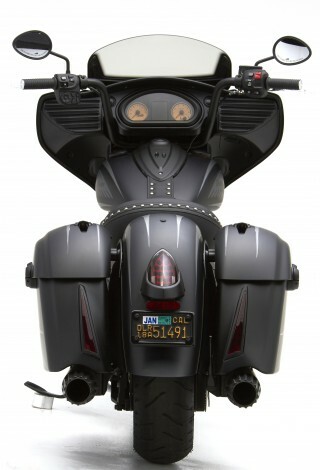 Out back, a pair of turn signals were incorporated into the saddlebags to further visually lighten the bike. 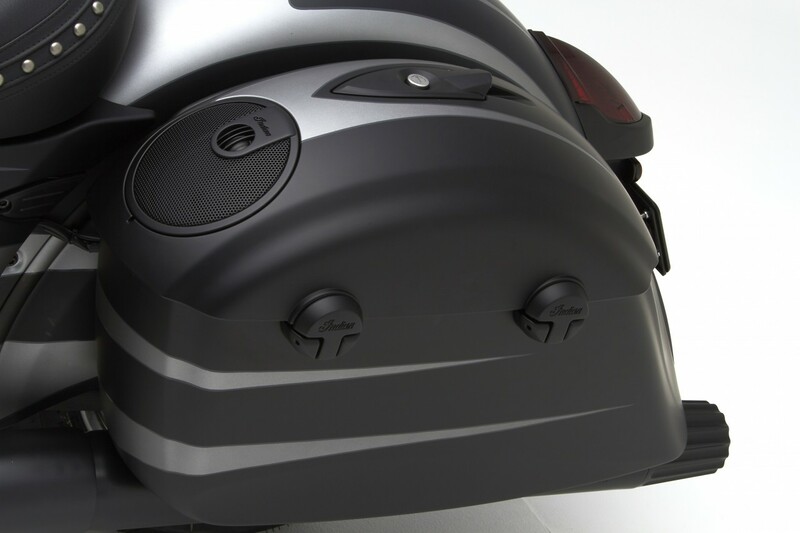 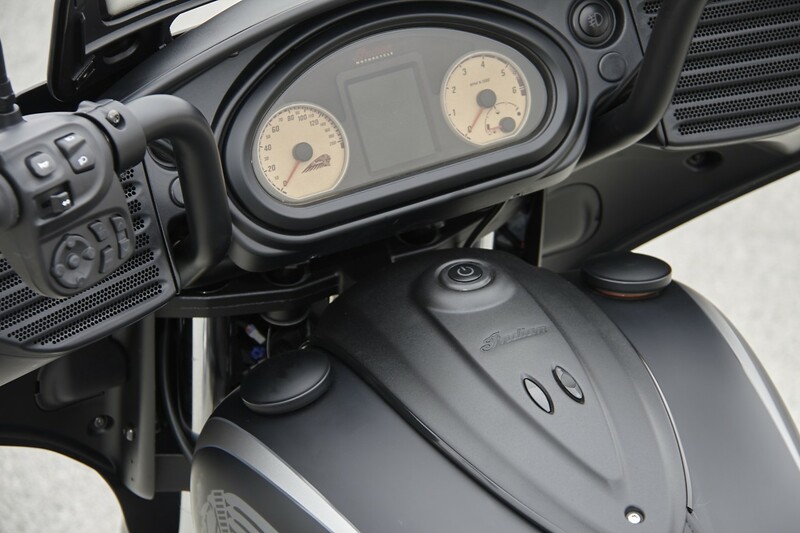 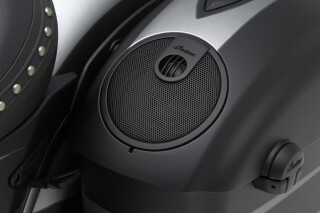 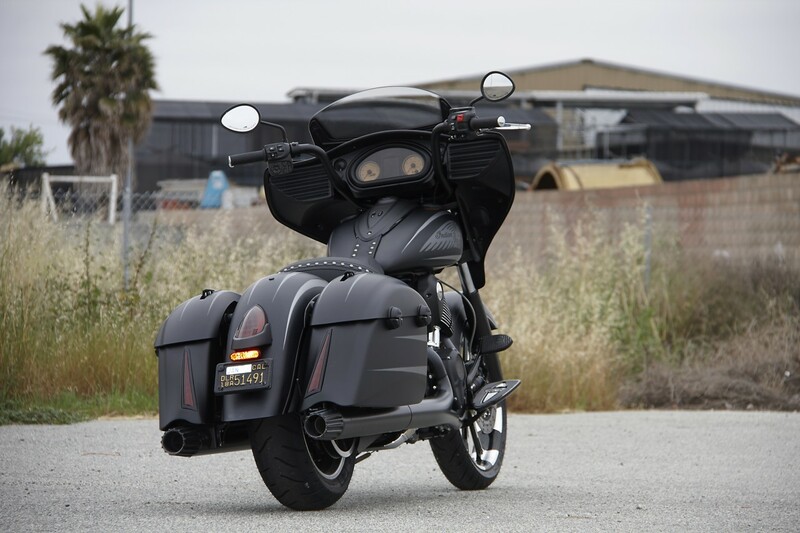 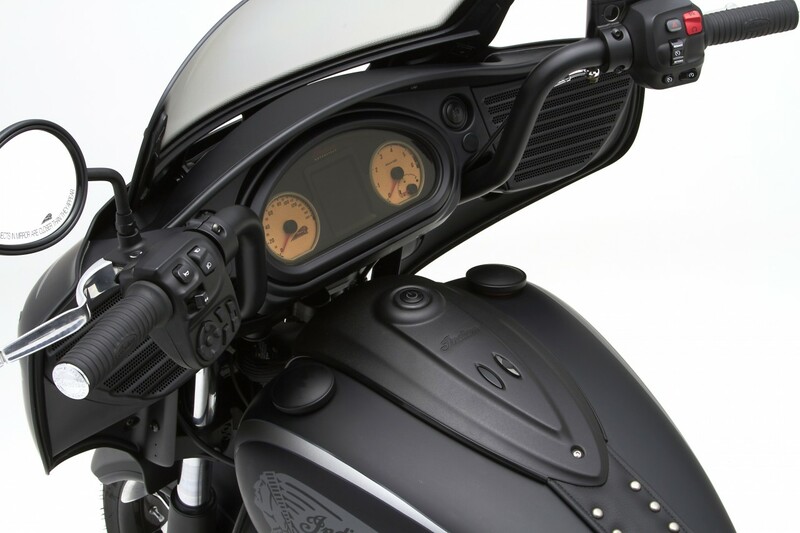 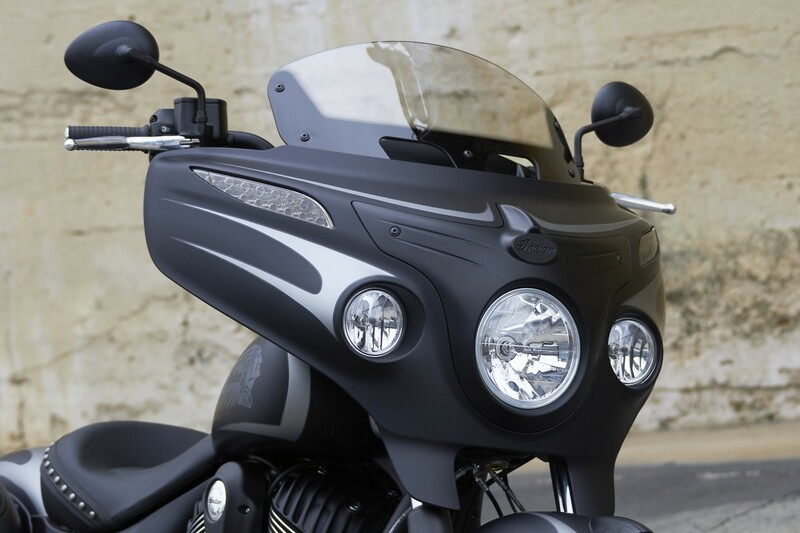 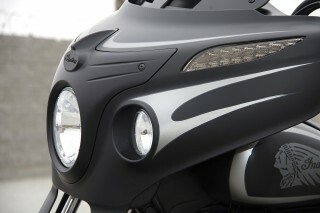 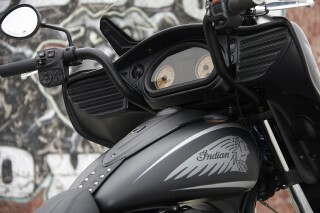 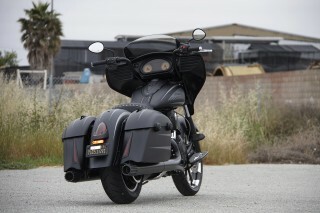 “We played with different lights, but we just really liked the look of these,” Sotelo says, “so we frenched them into the bags and matted the taillight out.” The saddlebags also received 100-watt Authentic Indian Motorcycle speakers to boost output of the already powerful audio system. 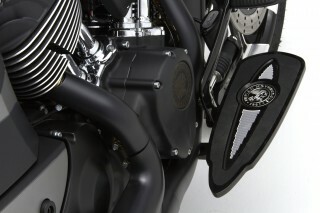 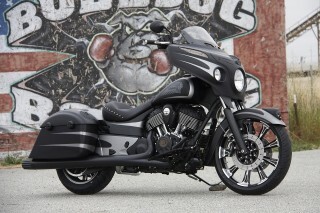 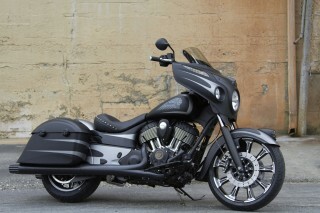 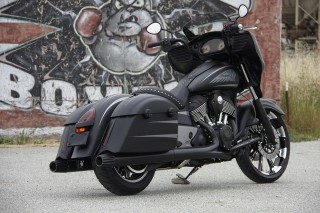 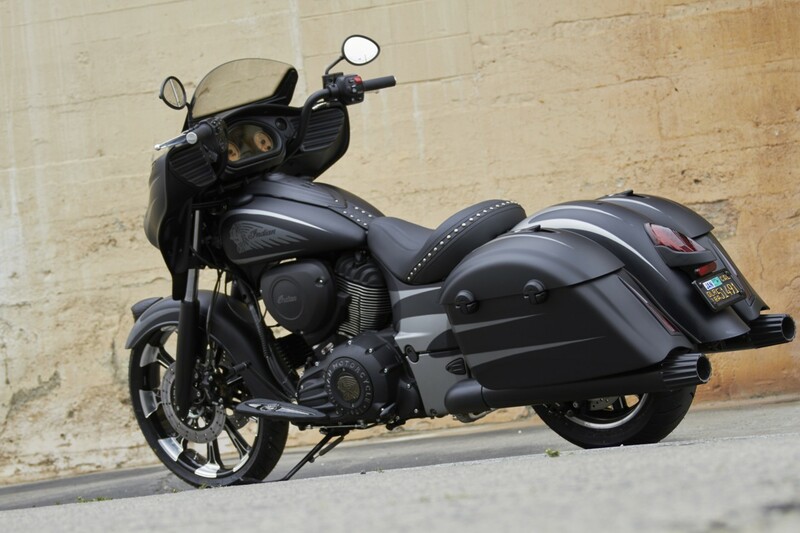 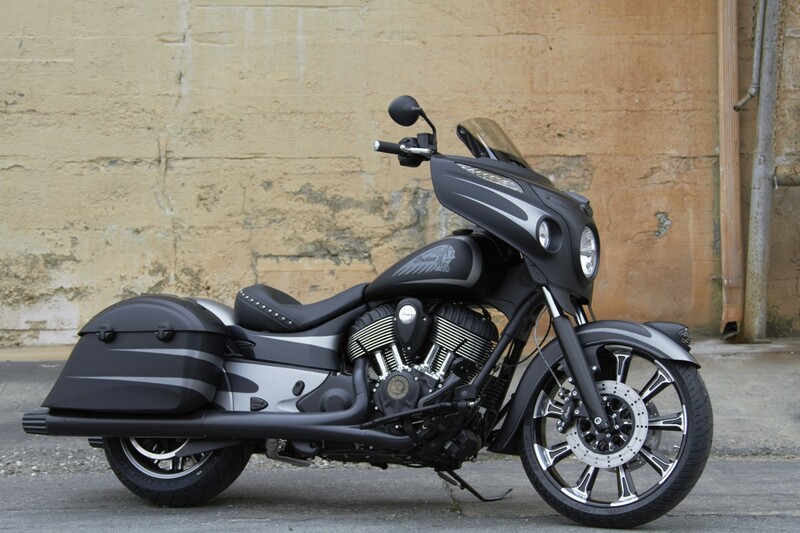 Finally, sticking out from beneath the saddlebags, a blacked out Indian Motorcycle Stage 1 slip-on exhaust with brushed billet tips was installed to offer a snappier throttle response and more bark to the already potent Thunder Stroke 111 engine. Visit Hollister Powersports online at HollisterPowersports.com. Learn more about Indian Motorcycle and the Chieftain Dark Horse by visiting IndianMotorcycle.com and Facebook, Twitter and Instagram social media channels.